Dash for Daylight Photography Products and Services. Action Pet Photography Photo Shoots, local no obligation action dog photo shoots, action dog photography, photography products, framed action dog photos, enlargements, pet photo gifts, action dog photography gift cards, and more. 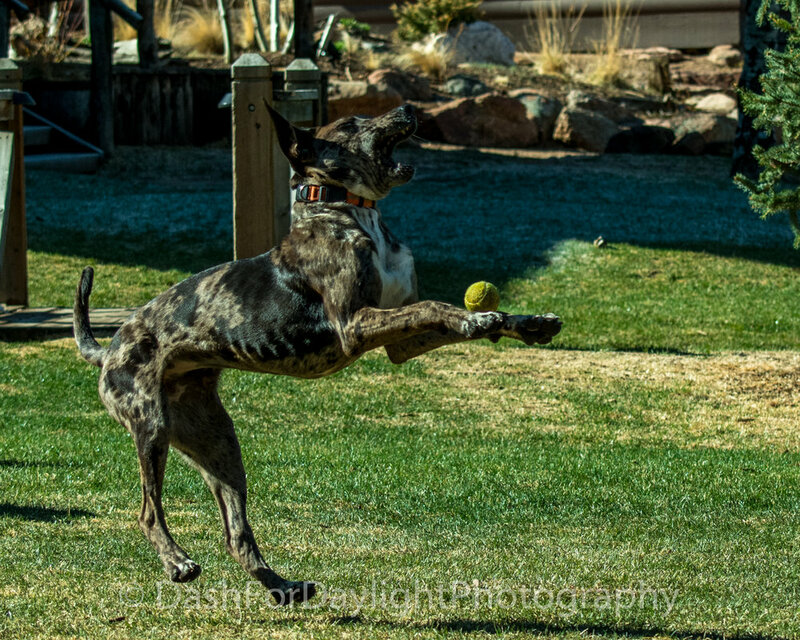 No obligation appointment to capture a handful of excellent photos that explore your pet’s athleticism and bounding joy. These no obligation sessions are limited to roughly a 20 minute drive radius around Louisville, CO (Louisville, Lafayette, Superior, Erie, Boulder, Broomfield, Westminster, and Niwot Colorado). We'll meet you where you let your dog run free and take a bunch of fantastic photos. We'll custom crop the best ones and send you a link to view them with a large watermark. If you like any, you can buy the digital images, which we'll photo process for enhanced quality. We will replace the large watermark with a very small, inconspicuous watermark in the bottom corner. There is no obligation to purchase any photos. Click the Orange Contact button and send us a message to request a no obligation photo shoot right now. Click the Gift Card button to learn more. Dash For Daylight Photography is not limited to fantastic pet action, although we'll admit that given Dogs zeal for life, they are our favorite subjects. We also photograph other action such as sports and recreational fun. Contact us to discuss any action you'd love to capture in crisp high resolution. Pricing upon request, based on activity, location, and client's objectives. Available upon request for digital photo images already purchased from Dash For Daylight Photography. If interested please ask about pricing, crop sizes, and delivery during or following your photo shoot. These products are also restricted to our home area noted above. Check out our Gallery of amazing animals, frolicking about and bounding with joy. Enjoy their pictures on the site or buy a few to admire anywhere, anytime. All images in the Gallery are available for sale and will contain a more discrete, small watermark in the bottom corner.